The Canadian open data community gathered from across Canada for the Canadian Open Data Summit 2016 on April 27-28 in Saint John, New Brunswick. This year’s event was extremely well attended with over 230 participants from the developer community, industry, various levels of government and not for profit groups. 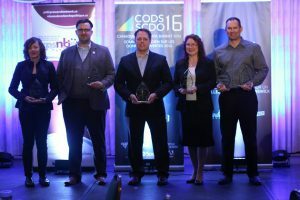 At the event, the Government of New Brunswick launched their Open Data Policy, the Government of Canada engaged on their Open Government Action Plan and awards were presented for innovation in open data. The event was packed with useful sessions, providing far more information than can be covered here so a few highlights instead. British Columbia’s open data efforts were well recognized with the Province of B.C. and the City of Surrey receiving awards. Below is the full list of Open Data Summit award recipients. Open Data Innovation Award – The Province received the Open Data Innovation award for two initiatives: the BC Data Catalogue and BC Physical Address Geocoder. I had the pleasure of accepting the award for the Province. Open Data for Democracy Award – The City of Surrey which received this award for increasing engagement with open data. Open Data Excellence Award for 2016 – Congratulations to the City of Surrey for also taking home the overall open Data Excellence award. GIS Manager, Bill McKay accepted their awards. Open Data Leader of the Year – Dr. Tracey P. Lauriault, a professor at Carlton University in Ottawa was awarded the Open Data Leader of the Year 2016. Left to Right: Tracey Lauriault (Carleton University), Scott Hardy (Edmonton), Chris Kershaw (Strathcona County), Elaine Dawson (B.C. ), Bill McKay (Surrey). In a great keynote address by Bianca Wylie, ODI Toronto encouraged the audience to make the process of policy decision-making as inclusive as possible by using open data. Wylie stated it is time to go beyond making policy decisions within the walls of government. Instead government should share the data – the evidence – outside government to bring more voices into the decision-making process. The New Brunswick Social Policy Research Network hosted a session for community organizations, academia and government. They encouraged participants to share stories and explore ways to provide greater access to data to inform allocation of program resources. And there was a brilliant workshop on Enabling Data-Driven Innovation in the Social Sector where participants discussed opportunities and barriers to data sharing between organizations. How do we improve our organizational ability to access and use our data? The data that we publish for others to consume should not be ‘special’. How do we ensure that we have consistent ways to anonymize data to provide wider access for decisions? Do we know what data we have? Is it discoverable and catalogued? How do we improve sharing across the organization even if data cannot be made open? In the afternoon there was a federal, provincial and territory government roundtable session that provided a forum to share and discuss progress with open data, cataloguing and sharing and near term plans. Common metrics are required to report on the value of open data. The results of this roundtable meeting will inform Canada’s Open Government Action Plan.